Why The Golden Age and why now? The Golden Age is a remarkably rich and complex play, and there are many aspects that draw me to staging it for an audience today. The work examines the way in which one culture imposes itself upon another, and the ultimate crumbling of civilisation that occurs at the hands of this brutal process. It’s a story that grapples with our colonial history, as well as with the trauma of the first half of the 20th century. In this sense it is a deeply important narrative within Australian culture. The play was written in 1985, and theatrically, it marks an exciting turning point in Australian writing. In The Golden Age, Louis Nowra is actively seeking to depart from the domestic setting of many of the plays of the Australian New Wave. The result is something incredibly exciting: a play with great intellectual and imaginative scope. The narrative stretches from the Southern wilds of Tasmania, to war-torn Berlin. It grapples with cultural identity, class divide, language and storytelling, sexual awakening, government control of information, and more. It is like a Greek myth in its breadth and depth. It asks uncompromising questions about who we are, and who we allow to participate in culture. It’s this area of questioning that feels particularly pertinent to why we would stage The Golden Age today. Does directing an Australian play, rather than an international work, change your approach or how you consider the material with respect to an audience? Are you more conscious of questions of national identity in that moment? The Golden Age is not limited in the scope of its insight to its Australian context. In fact, it has had many successful productions all around the world. It seems that it resonates in particular with post-colonial societies. However, as an Australian, directing this Australian play for an Australian audience, I am particularly conscious of how this play speaks to our national identity – the complex and problematic history of our national identity, as well as where it stands today. National identity is something that we negotiate collectively through culture, and I think it’s crucial that all cultures question the state of their national identity. The Golden Age is a play that is particularly concerned with this, and constantly draws our minds into considering crucial questions about cultural participation and cultural inclusion. Louis does this in such a complex way, through examining language, storytelling, class and race. In this way, Louis’ play is the perfect story through which to reflect upon the Australian national identity. Ironically, I think the more specifically we make this production from our Australian experience, the more it might resonate with a non-Australian audience. The narrative of different cultures colliding up against one another is a universal and ongoing one. In 1985, when the play was first staged, many interpreted the treatment of the tribe of outcasts as a metaphor for the treatment of Indigenous people, particularly somewhere like Tasmania. Does that resonate with you? It's definitely possible for that analogy to be made. The genocide of Tasmania's original inhabitants by the European settlers echoes throughout the play in the way in which this play's tribe of white convicts are pushed into an asylum and allowed to die of disease and emotional trauma – studied like they're animals rather than people. That parallel is there to be found, but I'm not seeking to make the piece a metaphor in that sense. I find there to be resonances with other elements of our history – our treatment of asylum seekers for one. For me, the tribe's otherness goes beyond one single parallel. 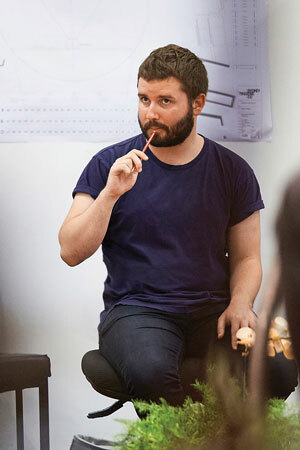 Have you spoken to playwright Louis Nowra about the work? Will he be involved? What advice did he share? Yes, I had lunch with Louis the other day. He was wonderful to talk to. He’s the kind of writer who wants to see his work interpreted anew every time. He's been adamant that he wants to be delighted and surprised when he comes to see it on opening night. He's an incredibly generous writer in giving us his support and being willing to answer any question I might have. The play is now 30 years old and Louis is very interested in having it interpreted afresh for a contemporary audience.